Jared Carlson is a Director, Government and Industry Relations, at Ericsson. Jared joined Ericsson in 2007 and his portfolio includes advocating for Ericsson’s interests in the areas of Net Neutrality, incentive auctions, broadband regulation, and many other topics affecting Ericsson and its customers in the U.S. and worldwide. Jared is a chair of the Federal Communications Bar Association’s Wireless Committee and chairs the Information and Technology Industry Council’s Telecommunications Committee. Jared is the co-author of “Keeping the Internet Open for Innovation: A Perspective on the Net Neutrality Debate,” which appeared in Issue 3, 2015, of the Ericsson Business Review, and recently filed Ericsson’s comments to the FCC on new spectrum opportunities for 5G in the U.S. Prior to joining Ericsson, Jared spent three years with Sprint Nextel’s Government Affairs group from 2004-2007, and before that, nearly seven years at the FCC. 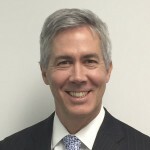 His various positions at the FCC included Legal Advisor to the Common Carrier Bureau Chief and Deputy Division Chief of the Wireless Bureau’s Spectrum and Competition Policy Division. Jared graduated from the University of Virginia in 1991 with a Bachelor of Economics and earned his law degree in 1996 from the College of William and Mary.